During the week of July 18-22, 2011, eight I.A.M. C.R.E.S.T Instructors from United Airlines, completed a 40 hour Dangerous Goods Train-the-Trainer program designed specifically for the Airline Industry. 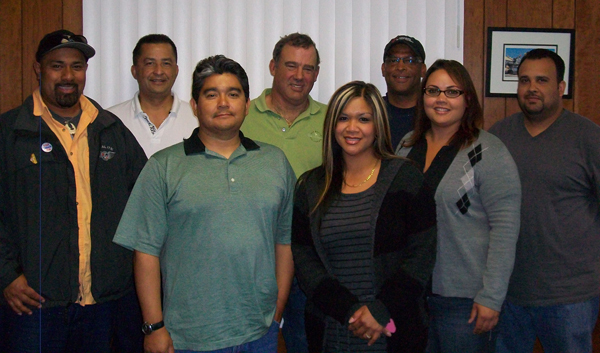 The training was held at Local Lodge 1781 located in Burlingame, California. The Associate Instructors may now deliver Dangerous Goods and Hazardous Material Awareness classes to selected locations. The classes were developed by IAM CREST to enhance the current initial and recurrent training provided by United Airways for workers who handle dangerous goods. The training is funded by a grant from the Pipeline and Hazardous Material Safety Administration. The awareness training stresses the importance of identifying dangerous goods, the associated hazards, and proper handling procedures at United Airways. I.A.M. C.R.E.S.T. – United Trainers Pictured above are: (left to right) Heneli Mahuinga, Paul Gozzip, Acie Grant, Stephen Ingraham, Emeline Harris, Eric Grogans, Teresa Montenegro and Benjamin Rocha.